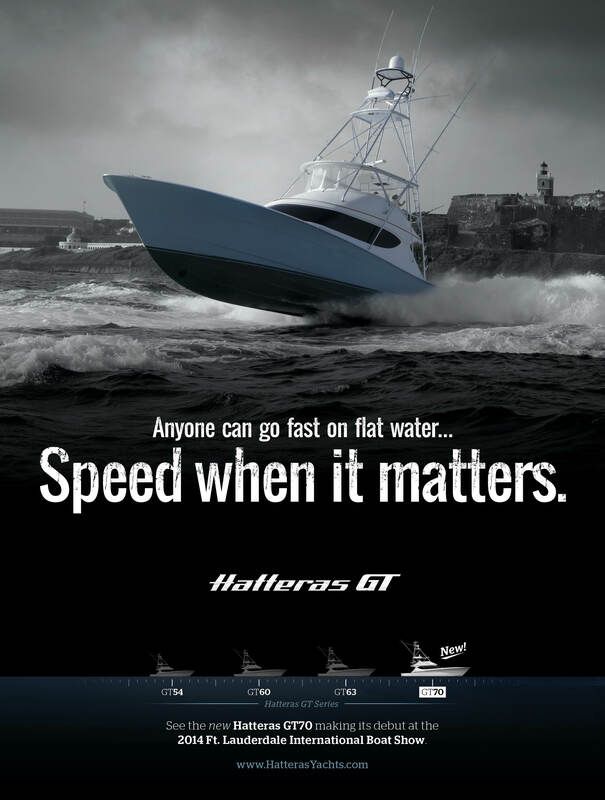 Hatteras Yacht’s newest ad has hit the street. This piece is for their GT series of sportfishing boats, and encourages readers to visit them at the FLL boat show and see their new GT70. The photo they chose for this campaign is from a series of high energy shots I took from a chase boat in San Juan harbor. It was all I could do to hang on to my camera while 40 sportfishing boats powered up and out the inlet during a Bimini start. This Hatteras GT caught some boat wakes just right and was almost launched while passing in front of El Morro castle. She landed gently and flew past. This entry was posted on Wednesday, September 10th, 2014 at 10:42 am and is filed under photo business, tournament, travel. You can follow any responses to this entry through the RSS 2.0 feed. You can skip to the end and leave a response. Pinging is currently not allowed.